I have signed up with some online paid survey sites, such as Greenfield Online, SurveySpot, SurveySavvy, Your2Cents, and Brand Institute, for more than a month and my overall experience with them so far was OK. Yes, many times I didn’t qualify for the paid surveys and I passed a lot surveys that only rewarded me with a sweepstake entry. I did manage to get through some survey screeners and completed the offer, though I haven’t seen any payment yet. We would like to invite you to participate in a short screener. 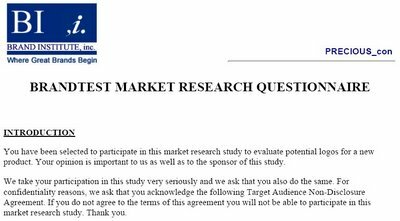 Participation in this screener is voluntary and those qualified individuals will be invited to participate in a paid online survey immediately. So the study is about “potential logos for a new product? at least that’s what they said in the disclosure. 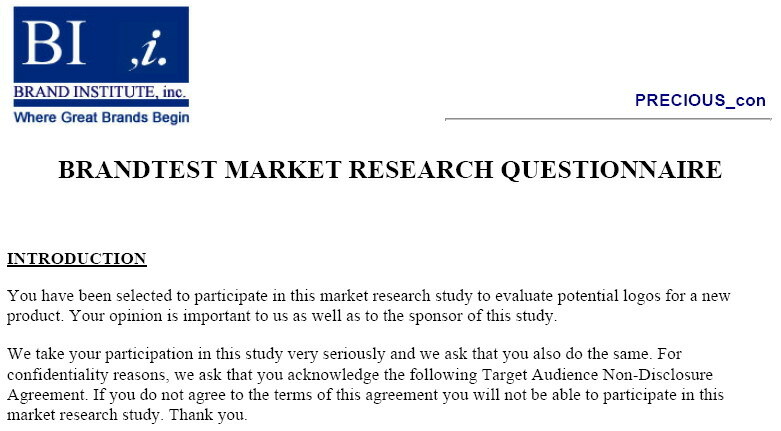 It’s always good to have an idea of what’s the survey is about before starting it. I agreed and there came the first page of the screener. What? Why my health has anything to do with my ability to evaluate logos? 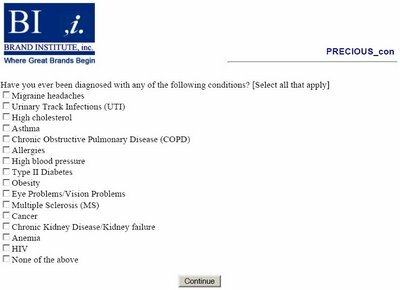 Actually, this was the second time that a Brand Institute’s survey screener began with a list of diseases. I’m in my 30s and what’s the chance for me to have cancer, HIV, or high blood pressure? The first time when I saw the list (I forgot what the survey was about), I chose None. Guess what? I was disqualified. So this time, maybe I shouldn’t be that healthy. OK, I have high cholesterol and high blood pressure. Continue. Isn’t that amazing? I mean if the survey is about medicine or health care, or anything related to health, I can understand why they need to know if I have certain diseases or not, but this survey is for LOGOS! Seriously, I have to ask them about the screener, which doesn’t make any sense to me.